Up to the time of Holly's death The Crickets included (from time to time) Joe B. Mauldin (b), Jerry Allison (d, v, g), Nicki Sullivan (g, v), Larry Welborn (b), Sonny Curtis (g, v ), Earl Sinks (v ) and Buddy Holly. For the most part of 1957 / 1958 it was Buddy (guitar and vocals), Jerry (drums), and Joe (bass) - with the '4th Cricket', Nicki Sullivan (guitar and vocals), touring throughout most of 1957. I said 'you're asking the wrong question. Where was Buddy gonna take music?" "It all came out of this idea of three chords, a group standing up there playing your instruments...you can see echoes of Buddy Holly and the Crickets in the Beatles." "He made it okay to wear glasses. I WAS Buddy Holly." "Buddy Holly was a poet. Way ahead of his time." "When someone like Paul McCartney says 'If it wasn't for the Crickets, there wouldn't be any Beatles', I say 'Excuse me? I'd like to hear that again!" "At least the first forty songs we wrote were Buddy Holly influenced". 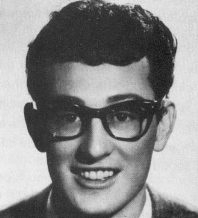 Buddy Holly was born Charles Hardin Holley in Lubbock, Texas, USA in 1936. 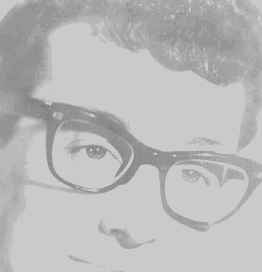 The Holleys were a musical family and as a young boyBuddy Holly learned to play the violin, piano and guitar. As a teenager he was already singing professionally as part of a country duo. Holly's big break came when they opened for Bill Haley and the Comets at a local rock show. He was signed by a scout from Decca Records to a solo recording contract. However, early success as a solo artist eluded him. Back in Lubbock, Holly formed his own band, "The Crickets", and began making records at Norman Petty's studios in Clovis, New Mexico. Among the songs they recorded was That'll Be the Day, which takes its title from a phrase which John Wayne's character says repeatedly in the movie, The Searchers. Norman had music industry contacts, and believing that That'll Be the Day would be a hit single, he contacted publishers and labels. Coral Records, a subsidiary of Decca, signed Buddy Holly and The Crickets. This put Buddy in the unusual position of having two record contracts at the same time! Holly's music was sophisticated for its day, including the use of novel instruments (for rock and roll). Holly was an influential rhythm guitarist, notably on songs such as Peggy Sue and Not Fade Away. While Holly could pump out boy-loves-girl songs with the best of his contemporaries, other songs featured more sophisticated lyrics and more complex harmonies and melodies than had been previously shown in the genre. Holly also managed to bridge some of the racial divide that punctuated rock, notably winning over an all-black audience when accidentally booked for New York's Apollo Theatre (though, unlike the fictional portrayal in his movie biography, it took several performances for audiences to be convinced of his talents). 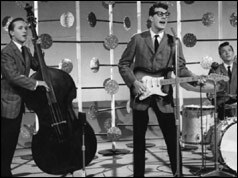 After the release of several highly successful songs, in March of 1958, he and the Crickets toured the United Kingdom. In the audience was a teenager named Paul McCartney, who later cited Holly as a primary influence (his band's name, The Beatles, was later chosen partly in homage to Holly's Crickets). Holly's personal style, more controlled and cerebral than Elvis's and more youthful and innovative than the country and western stars of his day, would have an influence on youth culture on both sides of the Atlantic for decades to come, reflected particularly in the New Wave movement in artists such as Elvis Costello and Marshall Crenshaw, and earlier in folk rock bands like The Byrds and The Turtles. He married Maria Elena Santiago on August 15, 1958 In 1959, Holly split with the Crickets and began a solo tour with other notable performers including Ritchie Valens and J.P. Richardson, "The Big Bopper". This event inspired singer Don McLean's popular 1971 ballad American Pie, and immortalized February 3rd as The Day The Music Died. Funeral services were held at the Tabernacle Baptist Church in Lubbock, Texas, and Buddy Holly was interred in the City of Lubbock Cemetery. Tributes Monument at Crash Site – September 16, 2003. In 1988, Ken Paquette, a Wisconsin fan of the '50s era, erected a stainless steel monument depicting a steel guitar and a set of three records bearing the names of each of the three performers. It is located on private farmland, about one quarter mile west of the intersection of 315th Street and Gull Avenue, approximately eight miles north of Clear Lake. He also created a similar stainless steel monument to the three musicians near the Riverside Ballroom in Green Bay, Wisconsin. That memorial was unveiled on July 17, 2003.